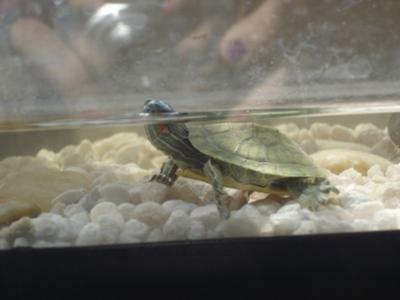 I have 4 red eared sliders, and one of them (the smallest one) just stopped eating. She stays all day either sleeping or stretching. They have a water filter and a water heater, and the other 3 are just fine, but this one barely moves, doesn't eat at all, and seems to be terrified of the biggest turtle. She's the only one that has remained with a light green colored shell, while the other three now have dark green shells. I've also noticed that they sometimes make weird slurping sounds, but it's very random, and I can't tell which of them is the one making the sound....it's not the smallest one, though. I feed them pellets, and sometimes small dried shrimps. Is there any reason why the smallest one isn't eating? Thank you!